The intention, as ever, was good. 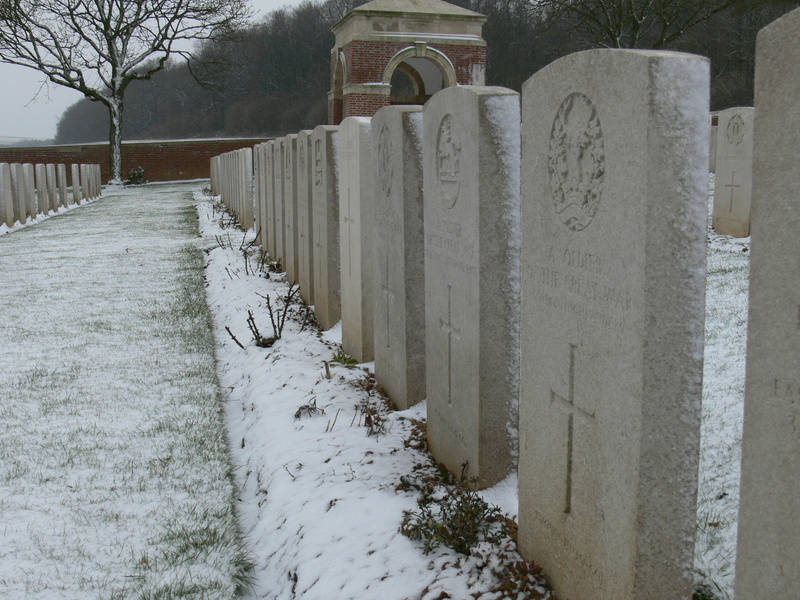 A regular series of postings after various battlefield trips detailing anything special that might have occurred and acting as a catalyst for those wishing to find out more. However, in practice, what has happened is that the guiding season has ended, and I have been engaged with other things, so for this first blog, I think it would be prudent to review the year from my perspective. It seems a bit self indulgent and it will test the memory banks a bit, but here goes. 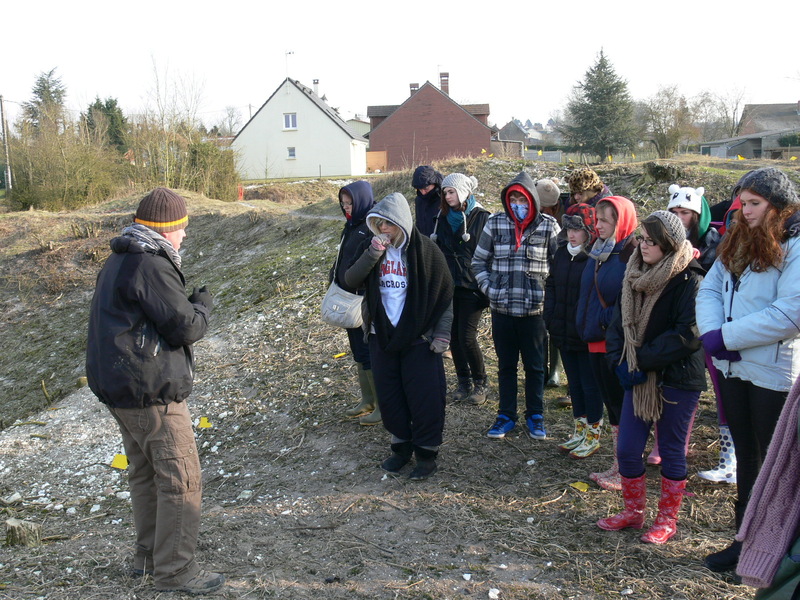 The first trip this year was back in February, with a group of students from Farnham Sixth Form College. Most of these students were approaching their learning about the Great War via the medium of literature; no great surprise there. In fact, the history students that also came on the trip were studying a completely different period, but that didn’t prevent their quest for knowledge about the Western Front. 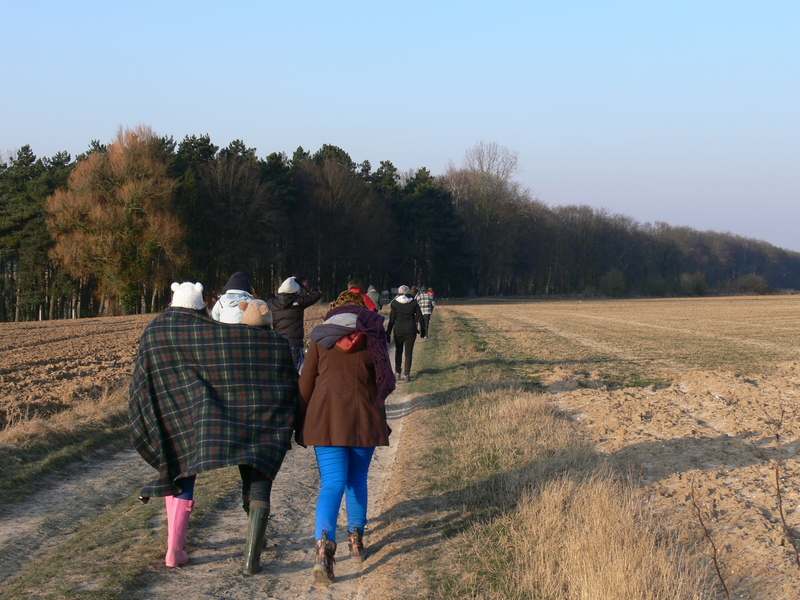 We had one major enemy on the trip, the intense cold, which made our outdoor walks a bit of an ordeal for some. Teenagers always know best, and despite being told to prepare for cold wet weather, not all had taken it to heart. Nevertheless, the highlight of the trip, as it was throughout the year was a visit to the archaeological work which was being carried out at La Boisselle on the Somme. This was particularly interesting for the students, as one of their set texts was Birdsong, which conveniently had just been screened on the BBC. Just a few months before, the main actors, Eddie Redmayne and Joseph Mawle had also visited the site to get an idea of the environment in which their characters would have had to operate, so there were plenty of connections to be made whilst out on the battlefields. For me, the most telling stop was the final one of the two day tour. It was, I must remind you, very, very cold. We had spent a good bit of time outside and it was starting to tell on one or two students. 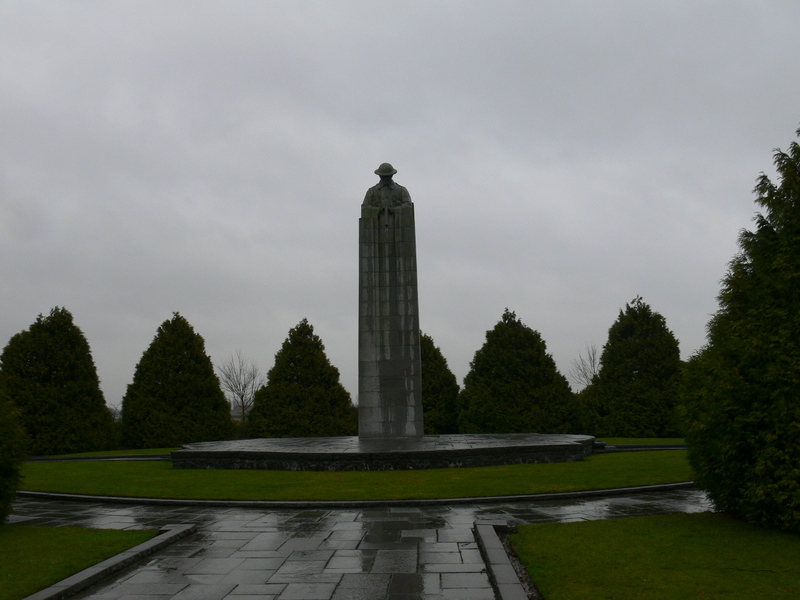 However, the two teaching staff were adamant that we should visit the Sheffield Memorial Park and the Accrington Pals Memorial, as Peter Wheelan’s play on the same subject was on the syllabus for the next part of the course. 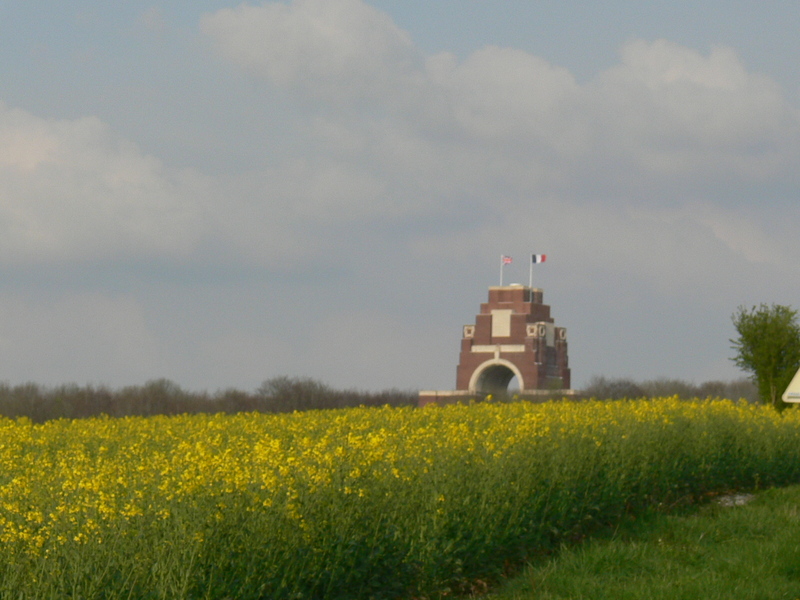 Those of you who know of the location will appreciate that a coach can’t get up there, so it meant a walk in a bitter wind to one of the Somme’s most poignant spots. 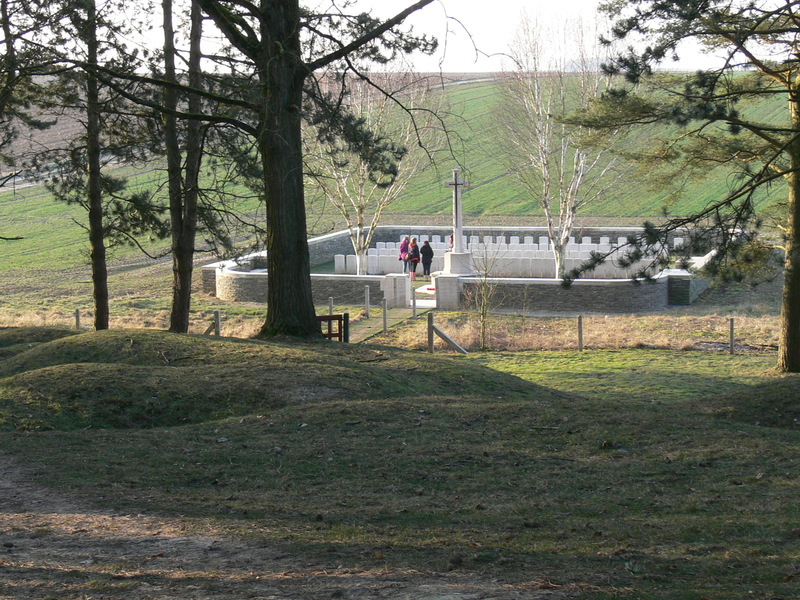 However, once there, and in the shelter of the copse, it was heartening to see some wander off and pay their own respects at Railway Hollow Cemetery while others took in the enormity of the losses here on that one fateful day, 1st July 1916. I think my favourite type of trip is one centred on a specific soldier and a family pilgrimage to find out what happened. 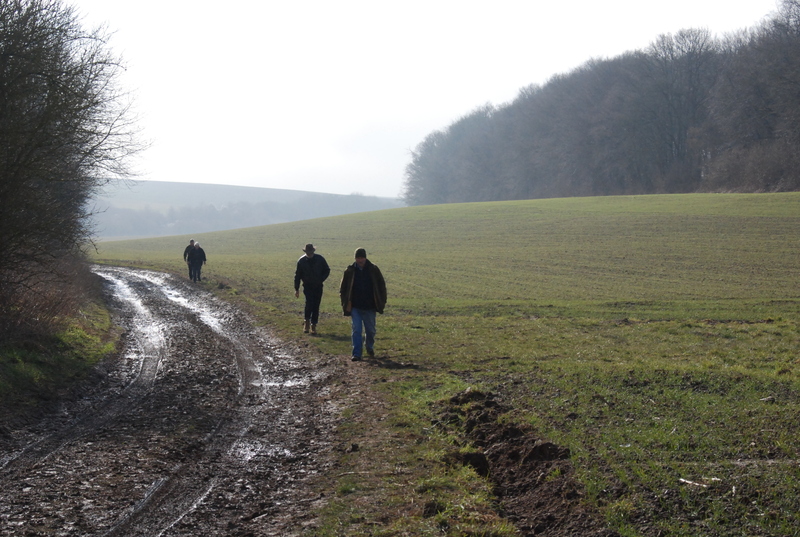 That was my good fortune in early April, as I guided a local family to a rarely visited part of the Somme battlefields to follow one small action that occurred in March 1917. Around Bouchavesnes in the early part of the month there was a localised attack in order to advance the front a few hundred yards to gain important ground overlooking the adjoining village of Moislains. 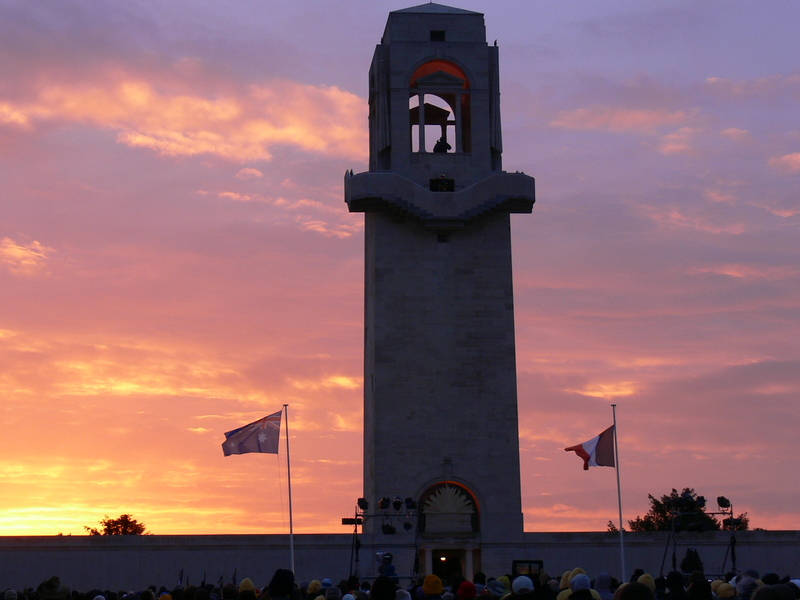 The 1st Worcester were among three battalions to advance early in the morning. Initially things went fairly well and the troops managed to gain the crest of the ridge where, as the War Diary states, ‘From Fritz Trench excellent observation was obtained over country near Moislains and excellent observation for own artillery was obtained. Enemy shelling was very heavy and a barrage was kept up on captured lines and lines of communication all day.’ What it doesn’t say is that the enemy shelling almost certainly did for Samuel Salter, my guests grandfather and great grandfather, respectively. 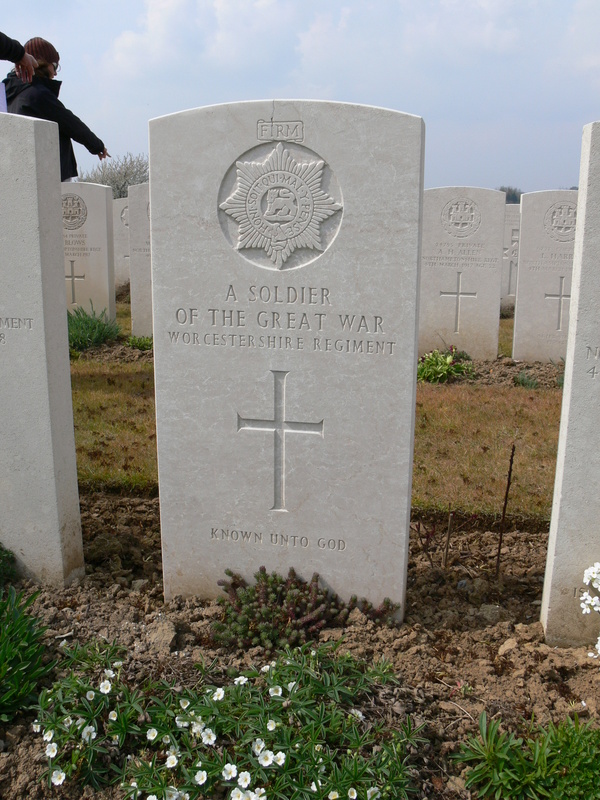 In one of life’s ironies, it was known that his best mate who had joined the battalion at the same time was buried at Fins New British Cemetery, and the next grave was an unknown from the Worcestershire Regiment. 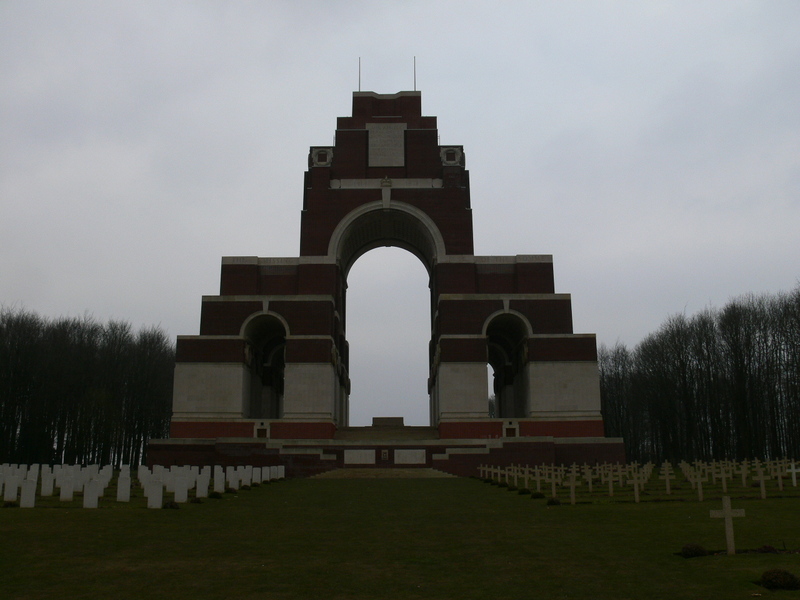 We’ll never know for sure if this was Samuel’s final resting place, and his name is listed on the Thiepval Memorial to the Missing of the Somme, along with over 73,000 others. Is this the grave of Samuel Salter, lost on 4th March 1917? 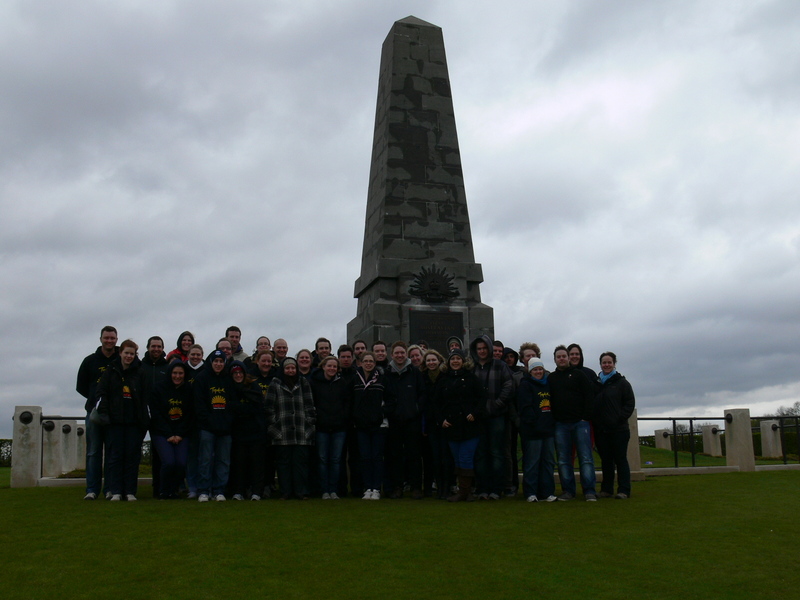 The next trip was centred around the commemorations for ANZAC Day in April. 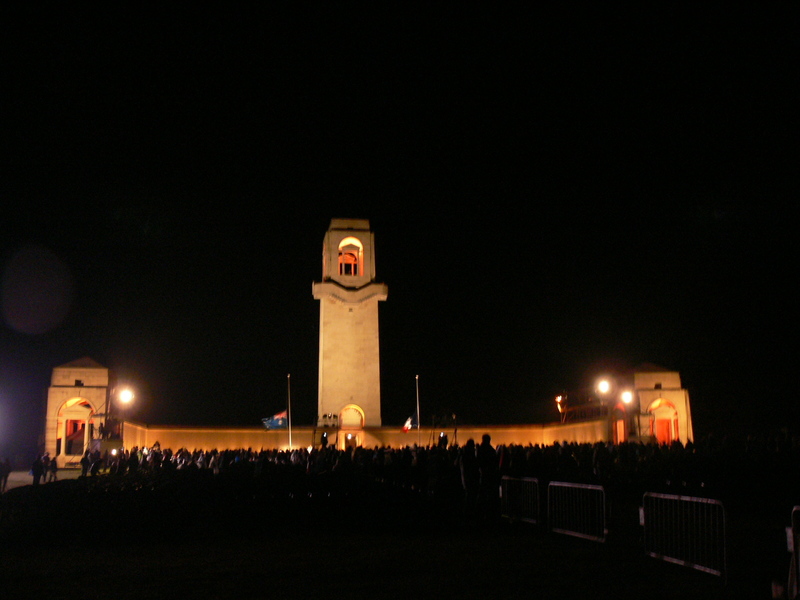 Since 2008 the Australian Embassy in Paris has taken on the job of arranging and liaising with the Somme Tourist Board the arrangements for the Dawn Service which is held at the Australian National War Memorial at Villers-Bretonneux. This year the arrangements were, as ever, flawless and my group was among many who braved a cold pre-dawn start for a wonderful service which ended at about 7.00 am, with the raising of the flags and the emergence of a weak sun to herald a new day. I was in charge of a group of around 30 or so, mostly Australians but a few New Zealanders as well. 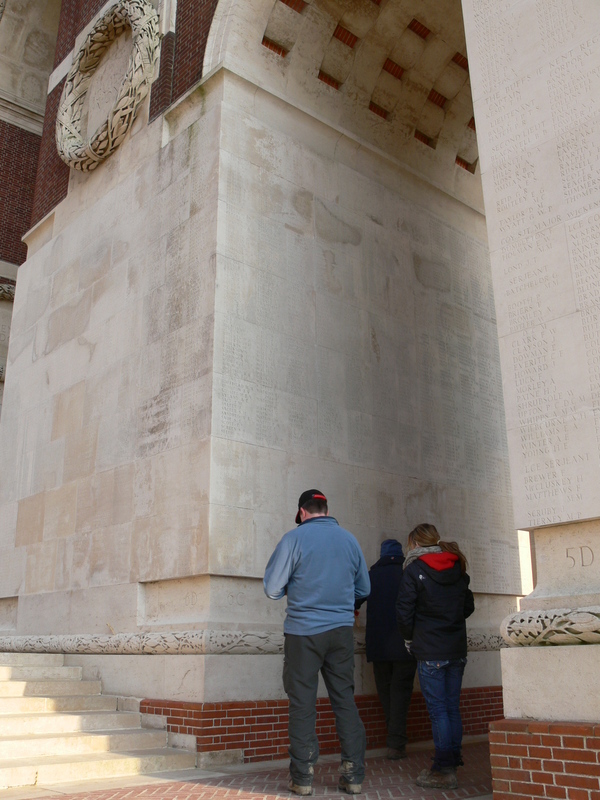 We’d travelled out two days before and spent some time around Ypres, Fromelles and Bullecourt. After the Dawn Service, and with a decent bit of breakfast inside us, we ventured back to the Somme. The weather had turned, it was wet as well as cold, but this failed to dampen anyone’s spirits. An oft heard comment when the weather goes against us is often along the lines of, ‘Well, they had it far worse’, which is probably true. It also suggests to me that those who visit the battlefields, in the main, don’t see it as a holiday, they see it as an enriching experience at many levels, even if that means getting wet. Not long after this trip, I enjoyed the company of a smaller group of Australians, this time on one of my regular three day battlefield trips. These smaller groups can be much more intimate and rewarding and as the group gels, their own family stories are often discussed. On this occasion, we happened to be in the exact spot in Polygon Wood where a relative of one of my guests had been awarded the Military Medal for his part in the advances in this area in September 1917. Brian asked if he could read some letters sent home not long after the action, and how could I say no. There were two contrasting written documents he wanted to share with us. One was a letter written home from his great uncle, describing how things weren’t too bad and how he had been caught up in the successful advance. The usual reassurances to family on the other side of the world were all included, and one can assume that when read back in Australia, the effect would have been one of relief and perhaps a certain amount of pride that ‘our Boy’ was doing his bit. By contrast, the other document read out was the citation for the Military Medal, which, in its typical official style made it very clear that the action for which it was awarded was brave and brutal, particularly for the enemy soldiers who happened to be in the way at the time. 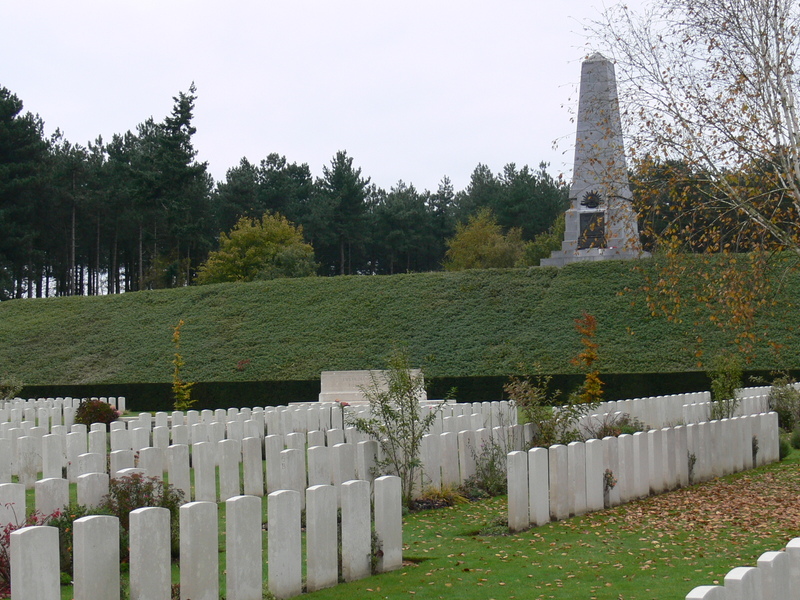 All of this specific action was happening right next to the butte in Polygon Wood, which now is the focal point of the Buttes New British Cemetery and the 5th Australian Division Memorial which stands on top of it. Hard to get a greater sense of place than that. I’ll carry on with a round up of later trips shortly. Thanks for reading this far.